Best dog trainers ever!! Both Annie & Bella attended the Basic Manners classes. Annie in fact, was the STAR pupil of the class. She EXCELLED! And the trainers used Annie to demonstrate new routines/manners/behaviors. Bella, on the other hand, was just too playful & "puppyish", and just wanted to play with all of the other "students", and was constantly distracted & distracting to the other "students". We could NOT get her to "focus"!! So we made the decision not to complete the class, and instead, bring her back the following sessions in the Spring or Fall. However, Brian passed away, so we never did get Bella back! If i could have swung it financially, i would have!m returned with Bella for SURE!! We have a Great Pyrenees show quality dog who is gradually rising in AKC-sanctioned competitions. 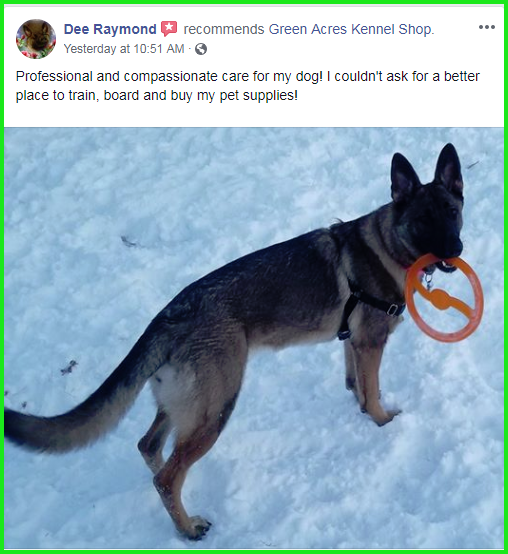 Although our breed group and Kennel Club can supply handling classes to train performance in the dog ring, we found that the early puppy classes at Green Acres were invaluable. ?Thanks to the training from Lois and Kate, our puppy was well-socialized and able to handle the interaction in tight spaces among other dogs and human handlers outside of the show ring. She conducts herself perfectly even in hotel corridors (highly recommend BringFido.com if you travel with your dog and need pet-friendly hotels). Even experienced canine handlers complement her behavior and manners.